It was a weekend of adventure! The Dashwoods moved in to Barton Cottage Saturday afternoon. It was a somewhat traumatic move because we moved them in the brooder with the screen on top which turned out to be a bit wider than the doors of our 1950s-built house. So to get them through the doors we had to tilt the brooder which meant the Dashwoods went sliding. There was much complaining. We put the whole brooder in the coop and cut one side of the wall and flattened it so they could leave on their own initiative. We put their food and water up on a block inside the coop by the egg door. We didn’t immediately close them up and leave them, we stuck around and talked to them a little bit. Then we closed all the doors and opened the windows. We worked outside the coop for a little while on framing the door and on the run wire. It did not get finished like we had hoped it would but we made good progress. This morning we were back at it. The wire around the run is all finished. The door to the run is built and hung — though because of some warped boards that took longer than anticipated — and the roof is, we hope watertight. We had to make a run to the home improvement store to get supplies to build the green roof. We thought we would get to it this afternoon but because of the warped wood and a few other snafus, it did not happen. You would think that by now I’d be better at estimating how long it might take us to complete different things, but nope. Hope springs eternal and I always hope the work will progress faster than it does. No matter. The coop and run is done and the Dashwoods moved in. The plants will have to live in their pots for a a little while longer. The Dashwoods couldn’t wait. We still need to paint the outside of the coop and put some framing up around the cleaning and egg doors but it is snug enough for now. The Dashwoods slept in it last night and did just fine. We are expecting rain tomorrow and almost every day of the week, so we will find out if the roof leaks soon enough. After we finished the run, I opened the door and put up the ladder and invited the girls to come out. Bookman was up on the roof of the coop making noise and they were not too pleased about that. They come to the door to look out but they have not yet braved the big world outside of a box. It is scary. Already since yesterday afternoon they have had more excitement than they’ve had since we brought them home in a shoebox. Here is a bit of video I took this afternoon. You can hear Bookman making noise and talking to me. He didn’t know I was recording. The red/brown one is Elinor, the black one with the white specks in her feathers is Mrs. Dashwood, the black one is Margaret, and the one with the white head is Marianne. Saturday morning Bookman and I were up early. We had to get to Hastings by 8 for the Riot Grrravel bike race. Bookman volunteered to help at check in. I had everything packed and ready to go the night before and had my kit laid out. I just had to eat breakfast and put Astrid on the back of the car. We made good time and got there a little early. I am always ok with being early that way I don’t get stressed and worried about being late. So while Bookman got instructions on what to do to check people in, I met a few other women who were racing, slathered myself in sunscreen and hung about a bit. I took a warm up turn on the gravel road where the race starts and I am glad I did because I quickly discovered I had too much air in my tires. So I let out some air and tried again and, oh so much better! course. There were about 90 other women riding along with me. It was a mass start and some people were there to race and others just to have fun. I got stuck behind a lot of people who were not racing. The group who were racing had managed to line up at the very front and they shot off and quickly disappeared. But it was just as well because I needed time to get used to riding on gravel and if I had been at the front I probably would have gone too hard, too fast in order to keep up with the experienced riders and I would have run out of steam much too early. As it was, I managed to gradually pass a good many out just for fun riders and soon started catching up with some of the faster riders. The roads were through rolling hills of farm country as well as along the bottom of a river ravine. That means there was a wicked descent that scared the pants off me because it was fresh, loose gravel and I was bouncing all over the place, riding my brakes so I wouldn’t crash, and trying to see the road and choose a line through the gravel that wasn’t as thick. I goggled at the woman right in front of me because she just let it go and slammed down the hill like it was smooth asphalt. Of course you know when there is a descent like that there is an ascent to look forward to. The gravel on the uphill was thick and loose too and it turns out that churning through gravel going uphill is really hard. I was in my lowest gear and wishing I had just one more, pushing hard and going so slow I was afraid I was just going to tip right over. But I made it! Gravel races are generally unsupported, meaning you get your course directions and you are on your own. There is no sag wagon, no one to help you if you get a flat, and the possibility you might take a wrong turn and go of course. I did really well right up until the last turn. I read my cue sheet (race directions) wrong and missed the turn. I didn’t go too far before I realized I missed my turn. So I turned around and got back on course with only a few minutes lost. I rode hard for the last three miles and managed to pass three people in front of me on the final stretch. I was hoping they would post a list of finishing order but they haven’t, at least not yet. I finished in just over two hours. Bookman thinks I was somewhere in the top 25, maybe around 20. Not bad for my first race! When I asked Bookman if he got a photo of me finishing he let out a big Doh! He was so excited watching me he forgot to snap a photo. Oh well. The photo would have shown me with a dirty, flushed face and a big grin. Yay for move-in day (chickens). Silly question- will they grow combs on top of their heads when they are older? or does this breed not have combs. And how long do you think it will take them to lean to perch on the bar? Jeane, not a silly question at all! They will all have combs eventually, they are just beginning to grow and are currently little nubs on their foreheads. I’m not sure how long it will take them to learn to perch/roost. The bar it is a little high for them at the moment and a little too big, but I suspect it won’t be for long — a month or so maybe? That’s so cool. Congrats on your big race! I can’t believe how big the chickens are!!! So cute! What a great race report. On gravel too!!! Are you doing another race soon – regular road race (vs gravel). Helen, I know, haven’t they gotten huge? I was considering trying a crit race but I don’t feel comfortable yet riding fast in a group yet. Maybe next spring 🙂 I am signed up for another gravel race in June, a 100-miler. I’m a little iffy on it because they don’t have cue sheets, only a gps file map and I haven’t learned how to use the mapping feature on my new gramin yet. Incentive to learn? Sorry about all of your rain. We got lucky and had a gorgeous day. Ohhhh….you had a big event weekend! I am glad the Dashwoods have moved into Barton Cottage….a home is a home is a home 🙂 I am super impressed and inspired by your biking adventures! Way to go Stefanie! 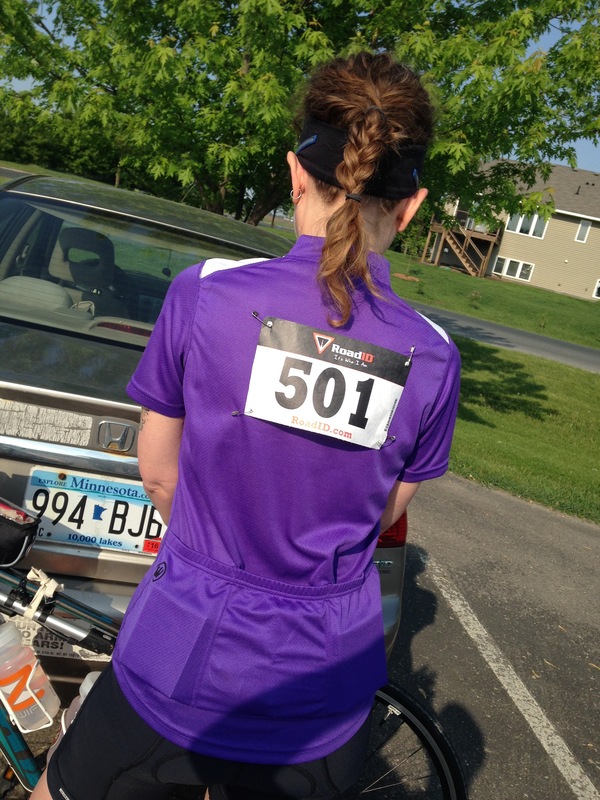 Congratulations on completing your first big race! You are AWESOME! Great stuff. Pleased for the Dashwoods and what a great result for your first race! Look forward to a video of the Dashwoods cheering you home! Ian, thanks! It was a great weekend all around. The Dashwoods are very happy in their new home and settling in nicely. It’s a relief to have them out of the house! cirtnecce, the Dashwoods seem to be really happy in their new home. And thanks! It was a great bike adventure and a great confidence boost too! I even got a cow bell and cheers when I crossed the finish. Fun! And good on you with your bike race. Well done! 20th, 25th, whatever, the thing was you did it and you felt good. whisperinggums, aren’t they funny? They are all healthy, happy birds which makes me happy too. Bookman cracked me up, he was surprised I didn’t edit him out of the video, but why would I want to do that? And thanks! It was a good race and lots of fun. A woman I caught up with at the end and I both agreed that just when we felt like we were getting the hang of it, the race was over. Happy I had a good time and very happy I didn’t crash or get a flat! The chicken videos are always fun. They’ll settle into their new home nicely, I’m sure. Congratulations on your race! That finish is something to be proud of! Thanks! I’m pretty pleased about the race. Happy that I finished in good time and didn’t crash! How fun! I bet the Dashwoods will soon love being able to stroll about their property, taking in the afternoon sun. And sweet “chicken man!” This was delightful. And congrats on your first gravel race! You inspire me. Wow, it’s a whole new world for the Dashwoods. Will they stay outside when it gets cold, too? I guess by then they will be full fledged grown up chickens and so they will have to, right? Talk about adventures–do you think it was more of an adventure for you or the girls? 🙂 Congrats on your first gravel race–I admire you! I think I would have gotten myself completely lost, to say nothing about riding on that kind of a surface. Do you plan on doing lots of racing this summer? Danielle, I know! It’s fun watching them try to figure it out. Yes, they will go outside when it is cold too except when it gets around zero, then we’ll keep them inside. The Dashwoods are winter hardy and are actually in more danger of overheating in the hot, humid summer than freezing in the winter. Moving them out to the coop was probably more stressful for me and Bookman, the chickens seem to have forgotten all about it already! And thanks! the race was fun and I always had someone else nearby except when I made that wrong turn! I have one more race this summer for sure and then it will be wait and see if something else fun comes up. Then there will be a couple sponsored “fun” rides in the fall and maybe another race. Given your escapades with the chickens I’m sure you’d enjoy a long running radio saga on BBC radio (The Archers) which is all about a farming community. Two of the newcomers have set up a premium egg business. when their mobile hen house burned down they moved them into a caravan and have been courting publicity under the theme of Hens on Holiday…..
BookerTalk, oh that sounds like fun! I will have to see if I can stream it on my computer! Welcome home, Dashwoods! How marvelous they are all settled in! You and the Bookman are no Fanny and John Dashwoods. Jenny, heh, no, we have spent far too much on the ladies to be a stingy Fanny and John! Very impressed with your racing adventures! Do you have a lot more races planned this summer?